Poet Jean Connor has published two books of poetry, 'A Cartography Of Peace' and 'A Hinge Of Joy,' both from Passager Books. On a recent afternoon, I met Vermont poet Jean Connor near her home on the campus of Wake Robin in Shelburne. Seated at a round table in the center of the room, Connor had neat stacks of papers and her two books of poetry in front of her; she was poised and ready to talk about her work and writing practice. Connor shared the website of a local poetry organization in Jeffersonville called Sun Dog Poetry Center, which also recently interviewed her for National Poetry Month. She talked about how, after a prior interview with former VPR host Neal Charnoff to mark the publication of her first book of poetry, A Cartography of Peace, local composer Erik Nielsen from Brookfield contacted her. Nielsen said since hearing her on the radio and reading her work, he had wanted to set her poems to music, which he did in 2011 with the collection called Voices of October, along with works by fellow Vermont poet David Budbill and William Shakespeare. Connor published her first book when she was 86. She says that though she had always written, the serious writing came in her retirement, after her full professional life as head of public library planning with the State of New York Library System. 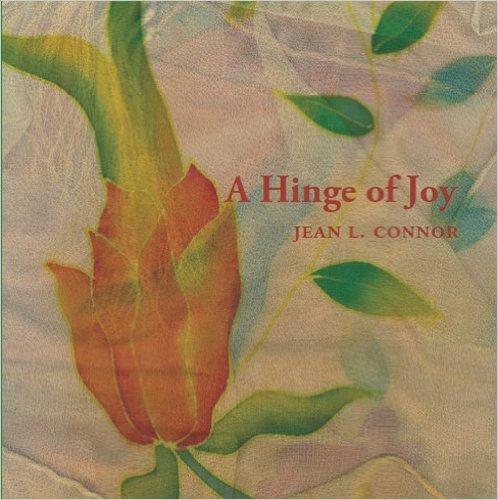 Jean Connor's second book of poetry, 'A Hinge Of Joy,' was published in 2010 when she was 90. "I really didn't get to writing seriously until I retired, which is unusual," she says. "I told myself that the writing would come later. And when I began, I did go back to school, in a sense. I took some courses at the New York State Writers' Institute at Skidmore College. And then when I moved to Wake Robin, I was able to go to the College of Fine Arts in Montpelier and picked up a class or two at the University of Vermont. So the real writing did come in retirement, which was early. I've had ample time since. And it's been fun." Connor said she was influenced along the way by former Poet Laureate William Stafford, and attended a workshop he gave at the Atlantic Center For The Arts. "I admire his person, his poetry and his contributions to poetry," she says. "I don't think I write at all like him, but he inspired a group of us to keep going after the workshop, and we have stayed in touch for years and years, exchanging poetry. [It's] a good way to keep going ... have friends who are writing and exchanging poetry and encouraging one another." Billy Collins, "for the humor and the thought that's in it." Mary Oliver, "for the thoughtfulness and the nature that is in her poetry. Ted Kooser, "also another former Poet Laureate, I like his work ... I'm enriched by the variety that's out there and the different way that poets go at things." Connor goes on: "We have many excellent poets in the state, which is what the Sun Dog Center is revealing and showing ... [former Vermont Poet Laureate] Sydney Lea visited Wake Robin and gave a fine reading here and he, in turn, was gracious enough to read my work and comment on it, for which I'm grateful." Connor published her second book, A Hinge Of Joy, when she was 90. She worked with the same publisher, Passager Books, which specializes in publishing the works of older authors. Hear Connor's conversation with Sun Dog Poetry Center in Jeffersonville here. Sitting by a lifeless form. What do Flannery O'Connor, Vampires in the Lemon Grove, Ulysses and State Treasurer Beth Pearce have in common? They're all referenced on the new record from Burlington-based band Violet Ultraviolet. Songwriter Jake Brennan spoke with VPR about the new album Pop City and the inspirations behind it. Many enclaves within the state claim an artistic vibe and this weekend, it's Windham County's turn to prove it. ARTstravaganza — A Weekend Of Celebration In Windham County aims to share the music, art and performance that make the region creatively unique.